The fur vest is a piece seen consistently on fall runways the past few seasons. It was seen in the Autumn/Winter 2009 RTW collections of Milly, Ralph Lauren, and Oscar de la Renta, each with unique flare. The fur vest probably gained most of its street-cred thanks to celebrity stylist, Rachel Zoe who exemplifies how to wear the vest in a way that’s effortless yet polished. So sure, the fur vest appears to be undeniably cute—but how does one exactly wear it? In today’s style file, we’re breaking down three essential steps to assembling the perfect look with the fur vest, all centered around our hero piece, the Eternal Child Fur Vest ($420). 1. THE VEST-MENT: Step one clearly is the central focus, the fur vest itself. We love the Fur Vest by Eternal Child ($420) for it’s non-bulky shape and ideal lower-hip length. It’s an investment worth indulging in because you will be able to wear with in many ways and for many years to come. 2. FOUNDATION: Creating the foundation layers that go beneath the vest is a matter of preference. If you like slacks, you should choose a blouse that won’t steal the show. Stick with solid colors and shirts that tuck in easily. With a neutral-colored pant, add a pop of autumn color like red, burgundy, cream, or forest green. Take a cue from Zoe and choose dark-wash, wide-legged denim. If skirts are your thing, choose a neutral, structured skirt as done on the Milly runway, and tuck in a fun patterned blouse, like the Printed Illusion Top by WINK ($195). The idea is to keep your foundation pieces tucked in close to your body so that your silhouette isn’t lost underneath the vest. With skirts and dresses (try the Aaron Ashe Area No. 3 Dress as seen on our model) tights are a must—we’d go with some ribbed tights and a cute ankle bootie like the Alexandre BirmanAnkle Booties ($365). 3. ACCESSORIZE: You may want to leave the vest hanging open like Zoe, but another way to streamline your vest is to cinch a skinny belt around your waist. Try the Emerald Snake Belt by Streets Ahead ($120) to pull together your look. The J Brand Low-Rise Pencil Jeans in Oz ($197) are a celeb favorite. We’ve caught Heidi Pratt and Paris Hilton (who purchased hers at our store) in them. And now we spotted actress Kate Beckinsale strutting in hers. We love that she kept them the center of focus by wearing neutral tones, from her cream platform pumps to her gray tank. Along with late night fast-food taco joints and eating ice cream from the carton, reality-tv is a guilty pleasure that can sometimes just feel so right (and secretly dirty). So for those reality-tv fans out there, closeted or not, we present you with Real Housewives of Orange County, Gretchen Rossi. Click to see what’s available from Superdry online! Some people wear their hearts on their sleeves, and others wear their thoughts on their tees. Katy Perry, LeAnn Rimes, and Rachel Bilson are perfect models of the latter. Lately, there have been several celebs spotted in graphic message tees. While a tee is of course a comfortable daytime option, they don’t have to look sloppy as evidenced by the talented trio here. Try pairing your tee with a skirt and major platforms like Perry, with on-trend denim like Rimes, or with a colorful fashion-forward caplet like Bilson. While LIVE! On Sunset has an array of message tees, we’ve featured a few here, but be sure to check out the store for full inventory. One of our favorite hosts, E! 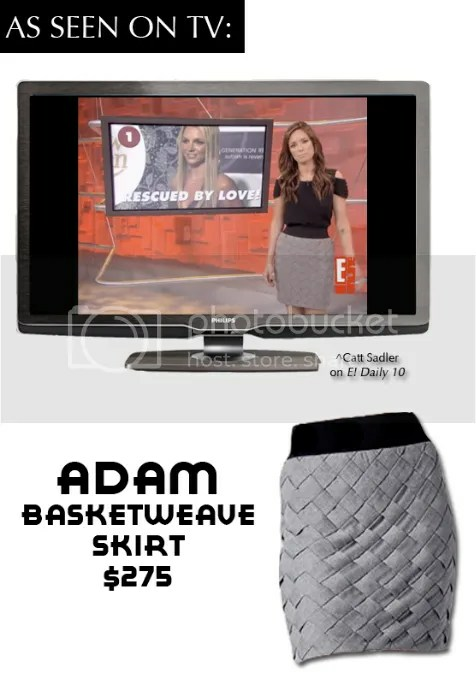 television’s Catt Sadler, wore the Basketweave Skirt by Adam ($275) recently onThe Daily 10. It’s not the first time the hostess-with-the-mostess wore looks from our store (and not the last we suspect.) The Basketweave Skirt is a primo choice for comfort-seekers that like to look fashion-forward while also feeling flexible. The skirt features an elastic waist and exposed zipper at the back—two trendy touches that are accented by tucking in any solid-colored blouse. Stay tuned for future looks spotted on The Daily 10!